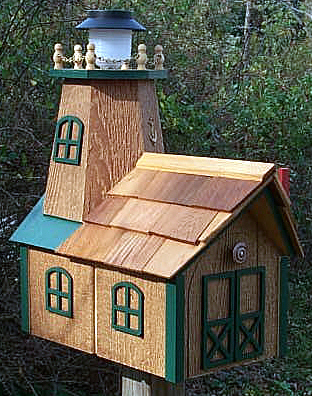 This handcrafted wooden Solar 4-Corner Lighthouse mailbox has natural cedar shingles for the roof. The size is 10" W x 18" L x 26" H. Meets U.S. Postal Service requirements. Trim and decoration are weather-resistant plastic. The floor and sides are MDO-exterior grade plywood. 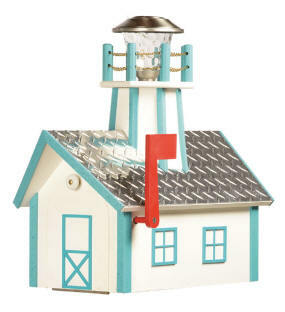 Double-tier solar light included. 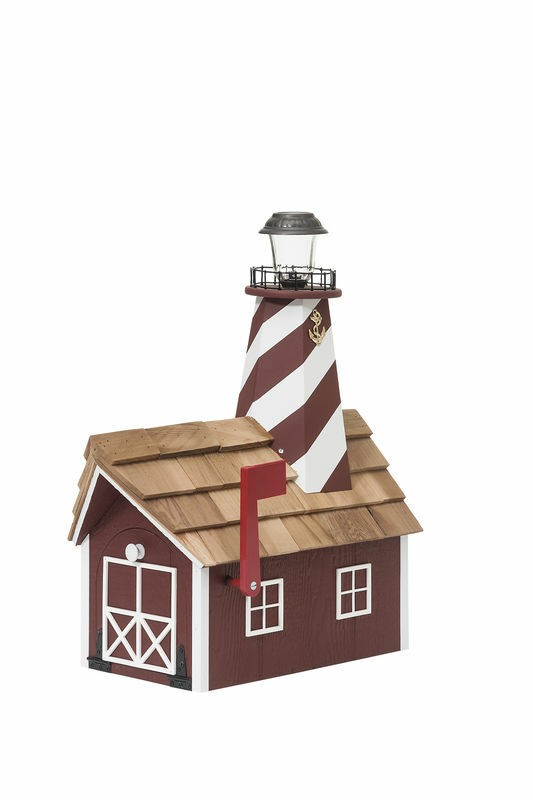 Colors available for this mailbox: Red, Charcoal Brown, Chestnut, Cream, Forest Green, Dark Gray, Hunter Green, Wedgewood Blue, White, Almond, Cape Cod Gray, Black, Brown, Blue, Navy Blue, Beige, Light Gray, Navajo White, and Clay. Please specify main color and trim color in the comment box that appears during the checkout process. 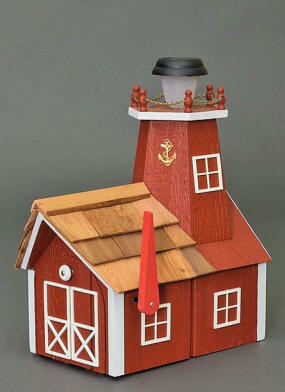 This handcrafted wooden Candle Light Lighthouse mailbox has natural cedar shingles for the roof. The size is 10" W x 18" L x 26" H. Meets U.S. Postal Service requirements. 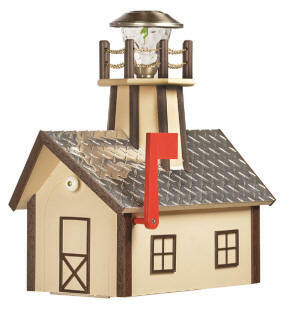 Trim and decoration are weather-resistant plastic. The floor and sides are MDO-exterior grade plywood. 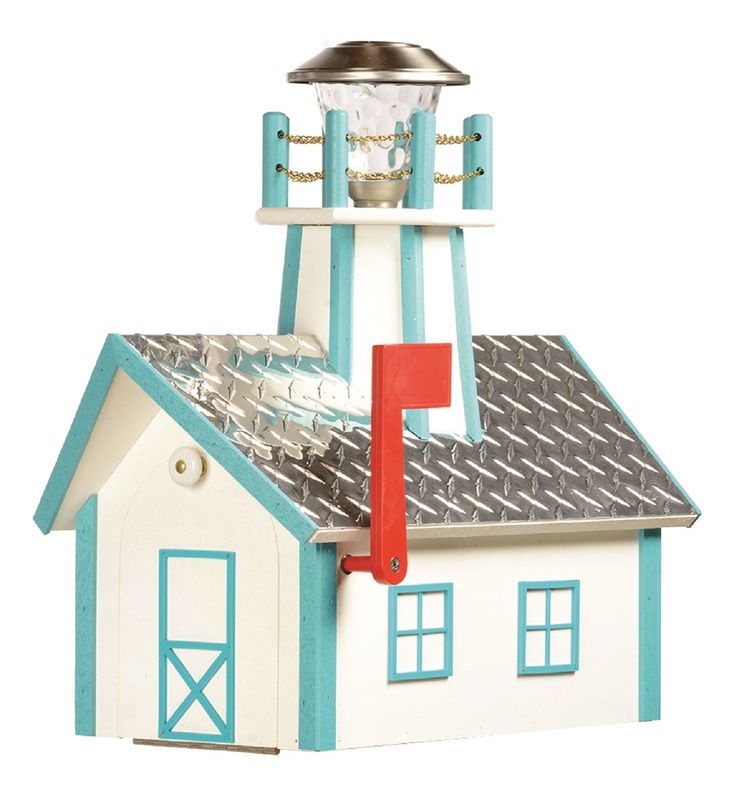 Candle light and 4" cord included. 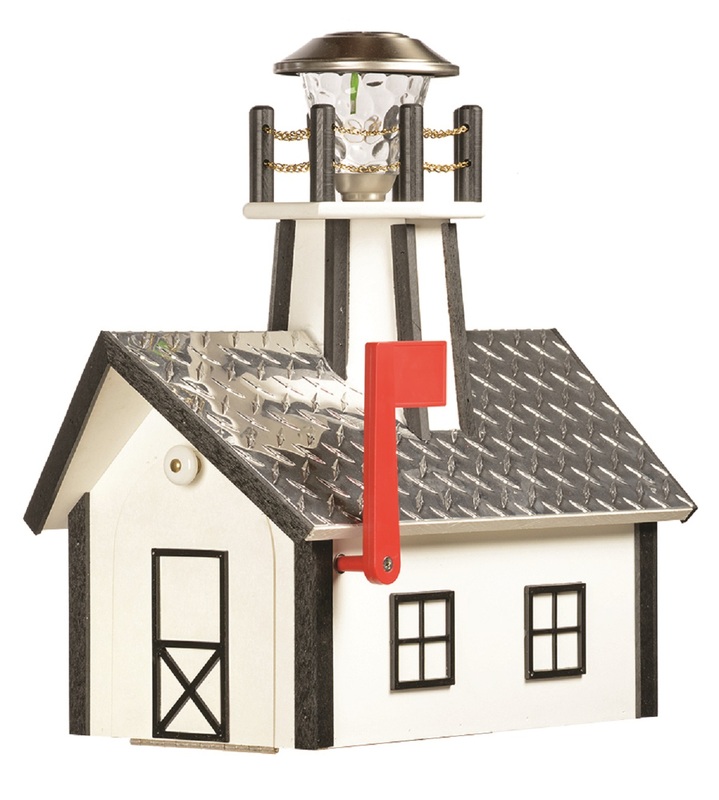 The EW Solar Lighthouse Mailbox is handcrafted and has a solar powered "beacon" that adds a touch of realism and helps guide you to the mail after sunset. 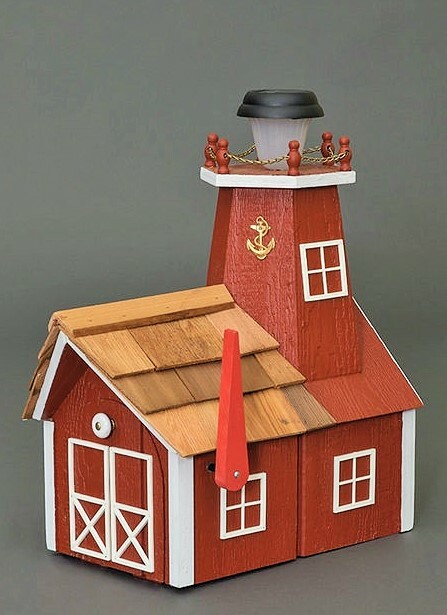 Natural cedar shingles are used for the roof. Trim and decoration are weather resistant plastic. Made with weather-proof TI - 11 plywood for the floor and sides. 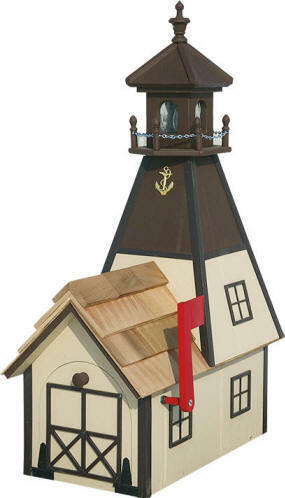 Size is 10" W x 18" L x 26" H. Meets U.S. Postal Service requirements. 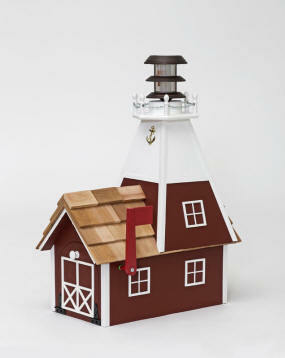 EW Lighthouse color selection: Barn red, green, white, black, wedgewood blue, natural. 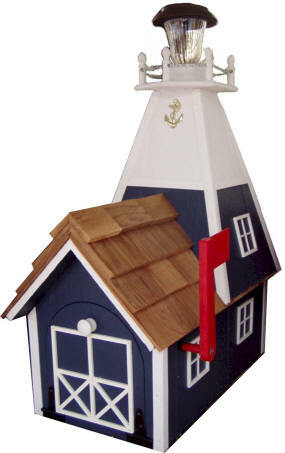 Note: Specify your Body and Trim color choice in the Comment Box which appears during the checkout process. 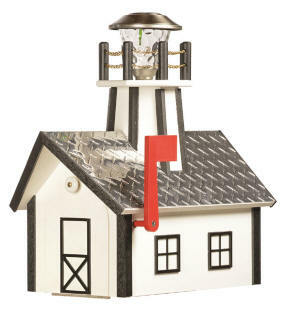 Body and Trim Color Selection for Deluxe Solar Lighthouse Mailbox with Aluminum Diamond Plate Roof. 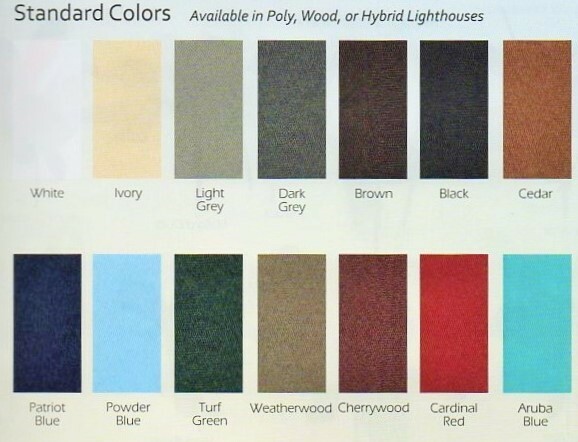 <<<<<<<<<<<<<<<<<<<<<<<----Note:Specify your choice of colors for the Body and Trim in the comment box which appears during the checkout process.